The Sunday game at Grandstand is struggling, cancelled last week (9 Oct 2016) with only 4 players, and withdrawals for today's game leaving us with 11, only enough for a game on the small pitch. got to be kidding....you have poorer response for this game than Grandstand but yet to choose to continue scheduling it here. When both the Saturday and Sunday games at the Grandstand are struggling, I'm not going to put in a lot of effort to try to fill up both games, especially when the new management there are being difficult with me. It makes more sense to consolidate the numbers into one game. The Saturday game is currently more sustainable, so it survives. The Sunday night game at Khalsa is to cater for those who can't get a game Monday to Thursday due to the games on those days filling up, with up to half a dozen players left on waitlist. Further, the management at Khalsa don't give me any hassle. In any event, it will take a while for players to get round to a new game. As I have pointed out many times before, my aim is to give people opportunities to play. There are always games available, especially if players are flexible about days, times and/or locations. Unfortunately, some games, and some players, become cliquey over time. The risk is that numbers for such games, even if once popular, dwindle over time. There is only so much I can do to introduce new players. Those who are keen on a particular game really have to do more to make that game sustainable, including being more accommodating of newer players (bearing in mind that being overly competitive may deter newer players), being more welcoming so that those who try out that game will come back in the future, and if necessary, introducing a larger number of new players. Looking forward to next Sunday's game at Turf City. Hopefully you guys will sign up too. Kelvin Neo asked me to put himself and 3 friends/relatives down for the game on Thursday, 19 October 2017, at Khalsa. Kelvin had only played 5 times before, since Q3 2014, at long intervals. His friend Raoyan had played a couple of times before, in Q4 2016. Wilson had played once before, in Q1 2015, while Matthew was playing for the first time. I understand that Kelvin and Raoyan are good, but Kelvin informed me that Wilson and Matthew were unfit. Kelvin also requested that the four of them be on the same team. I explained to him that it would be difficult to get balanced teams, especially with so many unfamiliar players on one team. Nevertheless, he asked that they be on the same team, which I accommodated. It is helpful if at least some of the group of friends/relatives are fairly regular, so we have some sense of how they will fit into the game. It is so much harder when the entire group are new or relatively new. It is also not fair to the other regulars or players in that game. I have suggested to Kelvin that he play more regularly. Even then, based on the report, I thought the game was not too imbalanced. There were again requests for the game yesterday (again, Thursday night at Khalsa), for groups of friends to be on the same team. Again, I accommodated the requests. It was easier to balance teams as apart from one new player, the rest were or had been regulars, or had played before on Thursday night. As reflected in the final score, the game was more balanced. If a corner is called but disputed, then it is a goal kick. 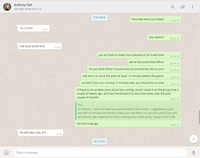 One of the players from last night's game (Tuesday night, 5-a-side at The Grandstand) messaged me after the game to say that Anthony Goh had been 15 minutes late, and asking me to speak to him about being persistently late for games. I asked the player if he had brought it up with Anthony's team captain, and he said no, so I raised the matter with the team captain. He did not think it was a matter of Anthony being held up at work, as he was also late for weekend games. If Anthony was going to be late, the least he could do was apologise on the WhatsApp group chat. Since Anthony first started playing in Q4 2015, his being frequently late for games has been brought to my attention several times, and I have messaged him twice about this. I have brought his attention to this thread, and reminded him to be at the game at least 10 minutes before the time the game is scheduled to start, and to give himself sufficient time to reach the game on time. As pointed out several times in this thread, it is a matter of time management.